Since now i have a set time to get up in the morning and go to the office, i actually have a morning routine. I usually wake up at 7. I need to be at the office at 9 but its really near my house so i leave for the bus stop at 8.35. My set up! All my skincare is in that tin on the right. 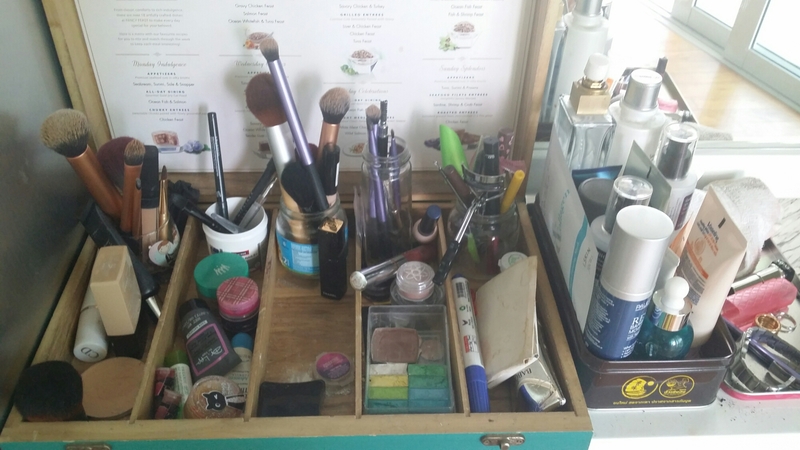 My make up box is helpfully categorized base – lips – face – eyes – assorted tools! When i wake up, I brush my teeth and wash off my moisturizer. I sometimes apply BHA and let it exfoliate while I do other stuff like eat breakfast and play with the baby. At around 8, i start doing the rest of my routine. I apply toner, serum, moisturizer and sunscreen. I try to use less products because I hate long complicated morning routines. I also apply deodorant when waitimg for the sunscreen to dry. After that it’s make up! I apply primer to my nose, nasolabial area and undereyes to conceal my pores and help my concealer. I apply foundation, then undereye concealer. Afterwards, i do my eye make up. Usually it’s quite simple, maybe 2-3 colours max. I line and also apply mascara. Just before I leave I will apply body sunscreen if necessary and perfume. So that’s it. What’s your morning routine? Is it as complex as mine? Haha.